Several months ago, a PR company, reached out to us to announce the launch of the BK Stuffed Steakhouse Burger. We'd been meaning to get around to this one, but we figured that we were in no rush...we figured that if it was awful, the public would vote with their dollars, and it would be discontinued. Since, it was still on menus since mid-January of this year, we decided to give it a shot. Happy Meal had demanded food that came with a toy, so we killed two birds with one stone. I believe that all Burger King locations now carry this particular burger. The combo....BK Stuffed Steakhouse Burger, fries, and a drink was $5.99, and it was ready in about 4 minutes. I entered into this with low expectations, and I was pleasantly surprised with the outcome. The Beef: The beef was flavorful and beefy. I assumed that this was fast food trickery, but it tasted fine. Keep in mind that this burger patty was blended with bits of jalapeño and Cheddar cheese. 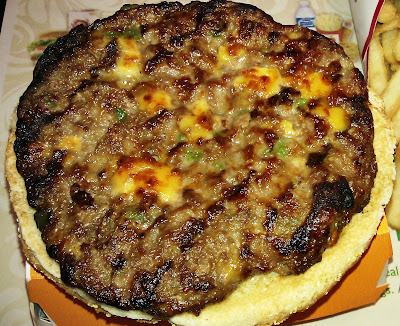 The beef was on the dry side, but the cheese and pepper bits moistened it up enough to be passable. The beef was a little oily but OK. The Seasoning: In the BK Stuffed Steakhouse Burger, the cheese and jalapeño were the primary flavors, so the burger was well-seasoned. The burger patty had a hefty amount of pepper and cheese mixed throughout. The pepper's hotness was mild enough to appeal to a broad audience--not children, though. The burger was a little salty, and I assumed that this was how it was processed by Burger King. I got the chipotle mayo on the side, but I confess to dipping a bite into it. It was tasty. If you get this, I would ask them to go easy on it, because it was strongly flavored, and it might overwhelm the burger. The Sear: Yes, there was a sear and even a little char. They really did use a flame broiler, and it really did improve the texture and flavor of the burger. The Preparation: The beef was a medium grind, and it had been processed to the point of being a little rubbery. It was not unbearably chewy--it was what I expected of fast food beef, but a little less blatant. The (6 ounce?) burger patty was broiled and grilled to Well Done. The Cheese: Burger King claimed. "Juicy 100-percent beef infused with bits of jalapeño and Cheddar makes for an experience you can see and taste in every bite." I don't dispute that there was Cheddar in there, but I would have expected it to melt away during the cooking process. It did not--there were pieces of cheese peppered throughout the burger, and they tasted a little like Velveta...not that there's anything wrong with that. The Bun: The bun was a moist, fresh, corn meal dusted, burger bun. It was toasted gently. The bun was not especially sweet, and it generally disappeared into the stronger flavors of the dish. The bun was fine. The Meat to Bun Ratio: The ratio worked. The bun provided some moisture. The Fries: Happy Meal attacked my fries. They were great. The Burger King fries were golden, crisp, and salty. The Value: The value was fine. It was a big burger, a good portion of fries, and a large beverage. I walked in a skeptic...I truly anticipated trying to choke down a vile burger. What I had, instead, was burger that was just fine. I wouldn't go out of my way to get one of these, except for the sheer novelty of getting something not awful from a fast food place. Still, I would not attempt to dissuade anyone from going to Burger King for a BK Stuffed Steakhouse. Burger Review : The BK Stuffed Steakhouse was just fine.